Tensed on its front legs in excitement. 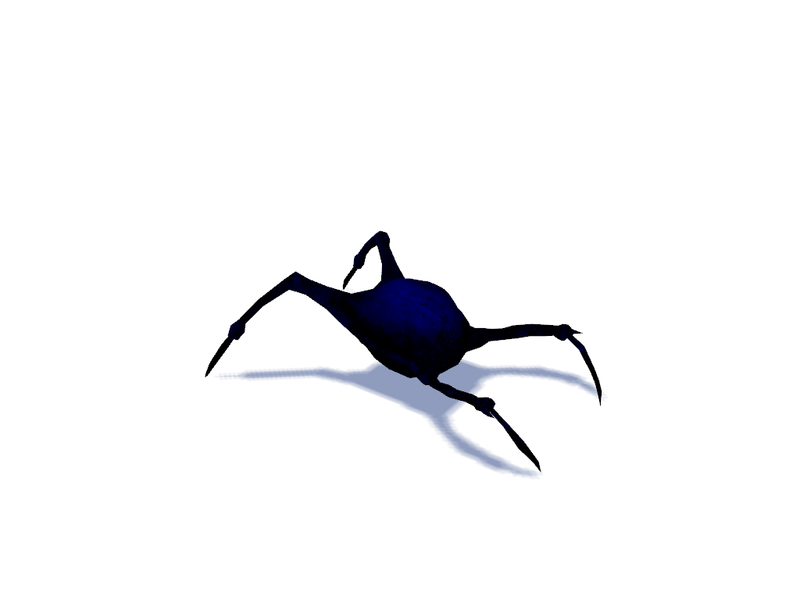 npc_kheadcrab is the entity name for a headcrab variant that can detonate like a grenade. They're virtually identical in appearance to fast headcrabs, but have an unusual hue and move twice as fast. Once a target has been spotted, the crab glows bright white and a timer is started. The crab will violently explode if it gets close enough to its victim or this timer runs out, but if killed before either, it will die only with a harmless pop. Sets the amount of health that kamikaze crabs spawn with. This keyvalue would normally start the headcrab burrowed underground until a threat comes within range. It's rendered useless since the model doesn't have burrowing animations. Upon spawning, NPC will move to the location of this path_corner. Assigns the NPC a targetname, used by other entities to refer to the NPC. Can be shared by other entities. Assigns NPC to a squad. NPCs with the same squad will report targets to the group and cover each other. Gives NPC the name of a hint node group. The NPC will ignore other hint nodes in the map that do not share this group name. Limits NPC to using the above hint group for navigation requests, but does not limit local navigation. Used to set the NPC into stasis and under what conditions it will wake up. 1 : Wait for a threat. Once found, wake up. 2 : Wait for PVS. 3 : Wait for an input. The NPC will wake from its sleep if the player comes within this distance. Toggles whether this NPC's squad mates will wake up along with him. Uses an info_lighting_relative to specify a location to sample lighting from, instead of using the NPC's origin. Multiplies damage taken by this NPC when hit with physics objects. 0 will make the NPC immune to this damage. Changes how the NPC is rendered in-game. See Render Modes. The FX amount used by the above rendering mode. The FX color used by the above rendering mode. Prevents the NPC from having shadows cast on it. Prevents the NPC from casting shadows. Does not apply to shadow mapping. Changes the NPC's model path (ex. models\player\player.mdl). Except where noted, flags are OFF by default. 1 : NPC is inactive until seen. 2 : NPC is muted until it's angry. 8 : NPC drops a health kit (or battery) upon death. 16 : NPC doesn't acquire enemies or avoid obstacles. 128 : NPC is inactive until called by a script. 256 : NPC uses long-range behavior. Sees and shoots farther than normal. 512 : NPC's corpse fades. 1024 : NPC will think outside of their PVS. 2048 : NPC is set up as a template and won't spawn until called by a template maker. 4096 : NPC uses alternate collision (player avoidance). 8192 : NPC doesn't drop weapons upon death. 16384 : NPC won't budge from the player's pushing. These special inputs are useless since the model doesn't have burrowing animations. D_HT : Hate the target. D_FR : Fear the target. D_LI : Treat the target as a friend. D_NU : Treat the target as a neutral party. Set the NPC's health to this value. Scales the damage taken by this NPC when hit with physics objects. 0 will make the NPC immune to this damage. Makes the NPC burst into flames. Smash this NPC into pieces. If not possible, just delete it. Deletes the NPC along with any children it may have. Enter/exit scripting state, where NPCs ignore a variety of stimulus that would make them break out of their scripts. They ignore danger sounds, ignore the player's Use, don't speak idly or respond to other NPC's idle speech, and so on. Gagged NPCs won't speak (or moan, caw, etc.) unless made to during a choreographed scene. Same as HolsterWeapon, except the weapon is destroyed once it has been concealed. Evaluates a keyvalue/output on this entity. Not guaranteed to work and can cause problems so handle with care. Set the overall color of the NPC. Sets the transparency of the NPC. Sets the damage filter this NPC will use. If no name is given, it's forced to use no filter at all. Adds to the entity's list of response contexts. Remove a context from this NPC's list. The name should match the key of an existing context. Removes all contexts from this NPC's list. Fired when this NPC takes damage. (!activator is the damage inflicter). Fired when this NPC is killed. (!activator is the killer). Fired when this NPC reaches half of its maximum health. Fired when this NPC hears a sound (other than combat or the player). Fired when this NPC hears the player. Fired when this NPC hears combat sounds such as shots or bomb explosions. Fired when this NPC establishes line of sight to its enemy. Fired when this NPC loses line of sight to its enemy. Fired when this NPC loses its enemy. Usually due to the enemy being killed/removed, or because this NPC has selected another target. Fired when this NPC establishes line of sight to its enemy, and that enemy is a player. Fired when this NPC loses line of sight to its enemy, and that enemy is a player. Fired when this NPC loses its enemy, and that enemy was a player. Usually due to the enemy being killed/removed, or because this NPC has selected another target. Fired when this NPC is hurt by a player (!activator is the attacker or vehicle driver (if friendly fire). Fired when this NPC is hurt by a player OR by one of the player's squad mates (!activator is the attacker or vehicle driver (if friendly fire). Fired when this NPC has refused to join the player's squad. Fired when this NPC comes out of a sleep state. Citizen, Medic • Citizen, UM • Combine, Cmp. • Kleiner, Cmp. • Monk, Cmp. • Crossbow Turret, Frn. • Floor Turret, Frn. • Laser Turret, Frn. • Rocket Turret, Frn.